There were two major seizures of illegal elephant tusks Kenya’s Mombasa airport this month. The largest – 3 tonnes worth an estimated $700,000 – was being exported as large bags of peanuts. The other, seized earlier this month, was composed of tusks that had been cut up into smaller pieces and covered in fish remains to pass as fish exports. The illegal animal parts trade, much like drug smuggling, is ever inventive when it comes to moving product. 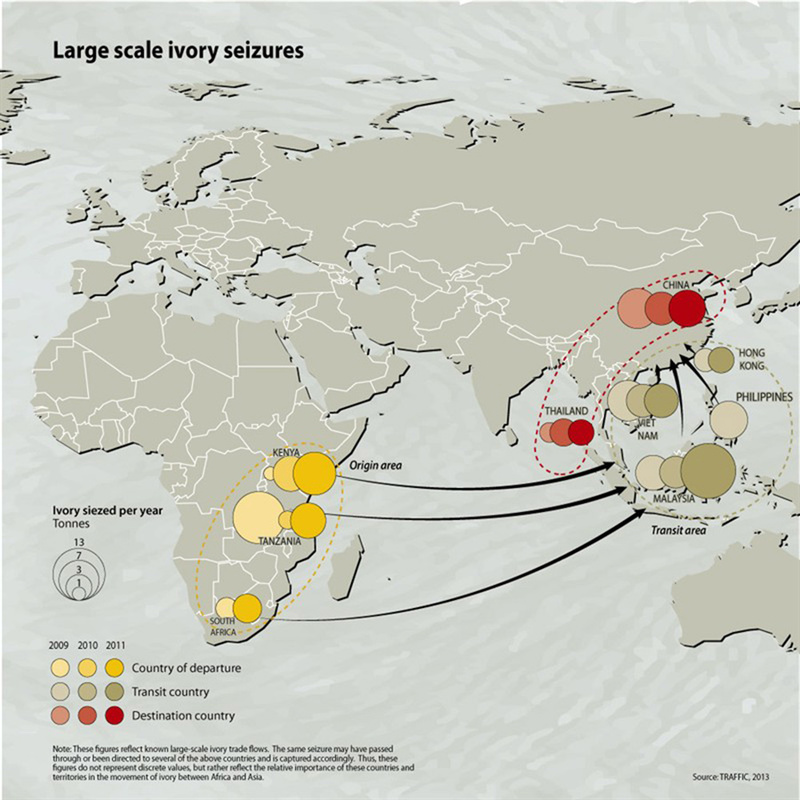 Large-scale ivory shipments originating from Africa have almost exclusively been seized in containers at major ports in Asia, where there is an established customs inspection system. Shipments mainly originate from Dar es Salaam, Mombasa and West Africa. A new technique for identifying illegal elephant tusk products – ivory – has been under discussion. Carbon dating of living animals, based on radioactive fallout from atomic testing during the mid-20th century, could be used to determine whether ivory specimens are legal – i.e. were gathered during the still-legal era which overlapped with atomic testing – or are from a more recent culling and thus illegal. A Kenyan official is quoted in this Washington Post article as saying that “unless wildlife poaching is declared ‘an economic crime’ with heavy penalties, the problem is likely to persist in Kenya and elsewhere in the region where poachers do not face serious consequences if they are caught.” This is an issue for national and international governmental regulation. But with this, as with other illegal animal part markets from rhino horn to snakeskin, the real challenge is getting at the end consumer. The market for ivory had dropped dramatically during the 1990s, when the end consumers in North America and Europe had decided owning ivory was no longer acceptable. The market has risen again in Asia with newfound economic purchasing power. There is also a very interesting piece from National Geographic linking the carving of religious sculptures, across all religions, in Asia with the illegal ivory trade. Reporter Bryan Christy suggests that if a moral and ethical argument could be made from within the various religions, that might go some way toward stemming the trade. The elimination of a species, not to mention the blood trade in their parts, needs to come to be seen as the antithesis of what makes a desirable object.